As pointed out by Ravenkeeper, I misstated the pin number on the pink BCM block. It is correctly pin 26 on both blocks. I have made the correction in the post. This simple modification will cast quite a bit of light toward the back of the truck along the sides...and it's FREE By adding a single wire to the BCM under the dash on the driver's side (at least in the 2016 and 2018 HD trucks) you can get the side mirror cargo lights to turn on whenever the truck is in reverse (when the truck is running) or the cargo light switch is turned on (when the truck is turned off). You need to run a wire from pin connector 26 on the Brown BCM block to pin connector 26 on the Pink BCM block (see picture). Following are some pictures of the amount of light put out with this mod. I forgot to mention that the 2500 I mentioned with the 4 Auto setting was a gasser, not a diesel. I understand the auto setting was limited to gas versions of the HD. An acquaintance had a 2500 HD (don't remember if it was a Chevy or GMC) that had the following settings. 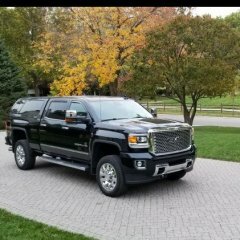 2 Hi Auto 4 Hi 4 Lo I wish my 2018 3500 HD had the same set up. It would be nice to have the Auto setting for those hays when full 4x4 isn't needed. ++++++++++++++++++++++++++++++++ I forgot to mention that the 2500 I mentioned with the 4 Auto setting was a gasser, not a diesel. I understand the auto setting was limited to gas versions of the HD. ++++++++++++++++++++++++++++++++++++++++ I am sure this guy's 2500 had the 4-Auto option as I was thinking of buying it before I bought my original 2500 Diesel. 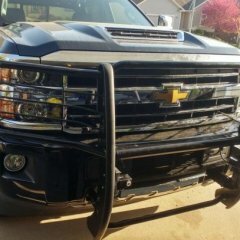 Does this extended warranty apply to all GM made 2018 trucks with the Duramax/Allison configuration or are there other factors involved? In other words, should everyone with a 2018 diesel receive this same notice - GMC and Chevy? Thanks. LED Reverse/ Backup lights in rear bumper step cavity? While this doesn't directly address adding extra lights to the back of the truck, this simple modification will cast quite a bit of light toward the back of the truck along the sides. By adding a single wire to the BCM under the dash on the driver's side (at least in the 2016 and 2018 HD trucks) you can get the side mirror cargo lights to turn on whenever the truck is in reverse (when the truck is running) or the cargo light switch is turned on (when the truck is turned off). You need to run a wire from pin connector 26 on the Brown BCM block to pin connector 25 on the Pink BCM block (see picture). Following are some pictures of the amount of light put out with this mod. 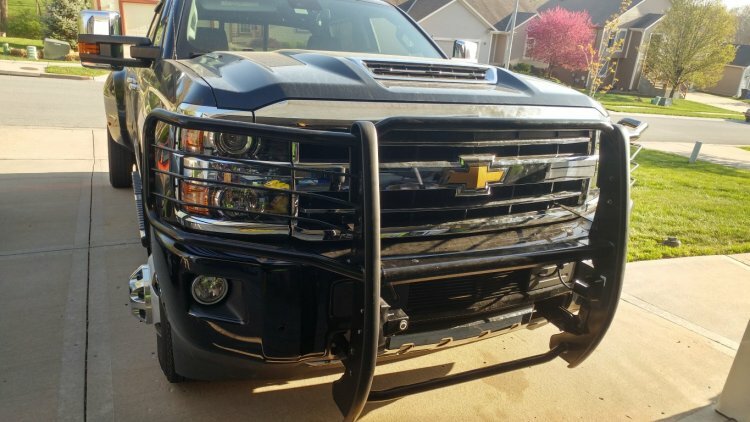 I installed an APS Lower Bumper Black Billet Grille I ordered from Amazon. It is aluminum powder coated black. I really don't see that it is anything special. Just a 2500 HD with MATTRAX. I have seen similarly equipped trucks before. Still, it's a neat truck and I've always thought it would be great to be able to swap out my tires for tracks and really go off road. Thanks for posting. Waaazooo, First, thanks for your service. Your post raises a question. You mention a station offering "highway" diesel blend. This made me wonder if you were in a rural setting where they sell highway diesel and "Red" (non-highway) diesel? If that is the case, you need to use highway diesel as Red diesel is for use only in vehicles used in agriculture or non-highway settings. If that is not the case, I wonder what they were talking about as I have never seen multiple grades of diesel fuel. The advice I have always heard and followed was to buy diesel only from stations/dealers who do a good volume of diesel sales as small volume stations are more prone to have diesel that has set for long periods of time which can lead to decreased quality. Buying from Sunoco, Costco, Sam's, Phillips or other stations where you see others buying diesel is usually a good sign that their fuel is reasonably fresh. Big_Mike23 I had similar questions (not just about factory errors) when I was looking into buying my first diesel pusher motor home. It seemed like every forum I looked at showed numerous terrible problems with the various makes and models people owned. It gave me second thoughts about buying ANY motor home. After a while, I started to realize that while there seemed to be endless problems, when I put it in perspective I was looking at a very small percentage of motor homes on the road. You know how it goes, people who are having problems are more apt to report those problems in forums than are those who have no or minimal problems. You always see the horror stories but rarely hear from those who are doing OK. Once I realized this, I still did my research but then made the best deal I could on the best motor home I could find in my price range. The same holds true for a new truck. You should always do your homework but you need to keep reported problems in context to the number of trucks on the road where people have good experiences. Definitely get the E rated tires. It isn't worth risking running the lower rated tires.